2. That big exercise is performed to the point of muscle failure–where you’ve “emptied the tank” of the energy in that big group of muscles. If you use the two above criteria, you’ll have a single exercise that is more powerful than many people’s entire exercise routines. Then, if you combine just a handful of exercises like this, you’ll have a routine to beat all routines. The traditional dead lift exercise is a single exercise that involves almost the entire body at once. However, that exercise carries too high a risk of chronic injury for me to consider it healthy, so my pick for the single most productive exercise is: the leg press. 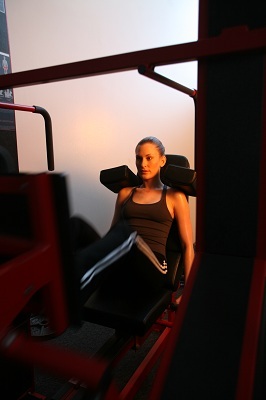 A leg press can work over half of the muscle mass of your entire body…all at once. Now do a simple thought experiment: imagine how tired you’d get if you took your legs to complete exhaustion…how much work and focus that takes, and how winded and exhausted you’d feel. If you’ve never done this on a leg press machine, just imagine sprinting, and going as fast as you could until you literally couldn’t stand up any more. Imagine if you attached a thick rubber band to the tip of your index finger, anchored it to your desk, and then did index finger curls until you couldn’t do any more. Can you see, just from that thought experiment how different the metabolic effect would be on your whole body of those two exercises that involve different amounts of muscle tissue? That’s the principle: select exercises that involve a LOT of muscle tissue. I’d always make some version of a leg press the cornerstone of my workout routine. A couple of other great exercises to bring in are a chest press and a pull down. Now that you’ve picked exercises that involve lots of muscle, if you only do a “comfortable” amount of work, then, once again, you’re not going to have a major metabolic effect, and you won’t see great results. The trick here is what you think about and focus on. Stop worrying about whether you’re moving the weight–that’s a prescription for dissatisfaction and bad technique/injury. Only be satisfied when you’ve completely “emptied the tank” with your muscles…when you are trying with 100% effort, and there’s nothing left. Get a friend, a trainer, a goal, whatever you need to do to challenge your comfort zone in this way on every exercise, every workout. I’ve just given you the foundation of what it takes to get amazing results. Many of my clients have seen the best results of their lives using just 3-5 exercises, and training just once per week–because they got this foundation right. If these principles aren’t already the foundation of your routine, what one step can you take today to move yourself closer? Think about it, write it down, and do it! If you want someone to personally work with you to optimize all of the fitness variables, taking you from wherever you are right now to where you want to be, then contact me or my team today to find out how we can help you do just that. See the Introductory Workout link at the upper right to contact us. Last updated by Chad Morris on September 6, 2011 .